Just a couple days ago, rumors leaked out that Apple might try to reimagine forgotten tech like air gestures and curvy concave screens for use in a future iPhone. But now, another company is taking a different page out of history, and this time its purpose is to help fight off the incoming notch apocalypse. That’s right, Doogee—a largely unknown Chinese smartphone maker (at least here in the states)—has brought back the slider phone. 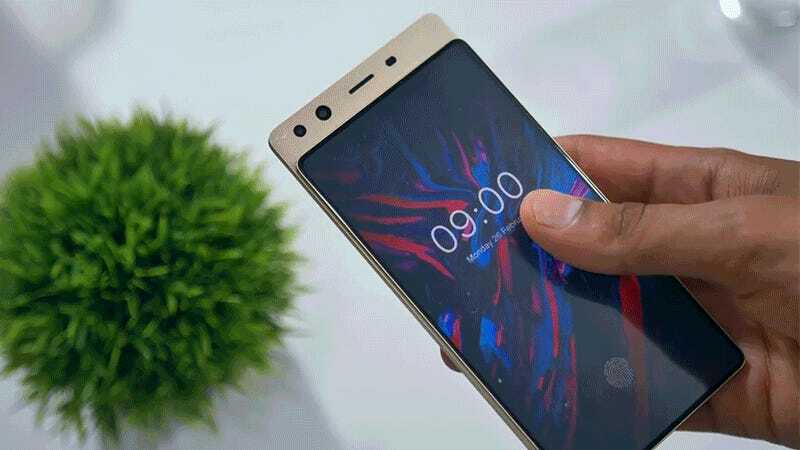 Dubbed the Mix 4, the phone, which is still very much a prototype, was revealed in a video from YouTuber Mrwhosetheboss. The screen isn’t functional (it’s just a sticker), there aren’t guts inside the body, and the box it came in was almost completely empty aside from the device itself. But still, this phone is a great example of how people can look to the past for ideas without it being a bad thing. To be clear, the Mix 4 isn’t a full-on slider, as the phone only extends a little more than half an inch to reveal a hidden front-facing camera. But what you get in return is a device with a staggering 97 screen-to-body ratio. Now you can hem and haw over the last few percentages, but to me, that’s bascially bezel-less. And unlike all those other Essential Phone and iPhone X “copy cats” there’s no need for a notch protruding into the top of the screen. Instead, the compromise Doogee makes on this very early Mix 4 is to increase the thickness of the phone to accommodate that slide out camera. When compared to the Galaxy S9 (8.5mm) or the iPhone X (7.7mm), the Mix 4 prototype measures 11mm from front to back, or almost 30 percent thicker than the Galaxy S9. And if Doogee wants to be really clever, the company could use that added girth to put a bigger battery the Mix 4. Trading thinness for longevity is a proposition that many people would be happy to make. Also consider that when the phone is closed, you also won’t have to worry about the phone taking random pictures of you. Now, like all prototypes, there’s a chance this phone never gets made, or could look radically different if it does hit the market. But the real takeaway here is that there’s no reason to be scared of the notch. For every problem, there are a number of potential solutions, and some fixes like the ones seen on the Mix 4 and the Vivo Apex, are both fun and innovative. And let’s be honest, who doesn’t love a little sliding action in their phone?